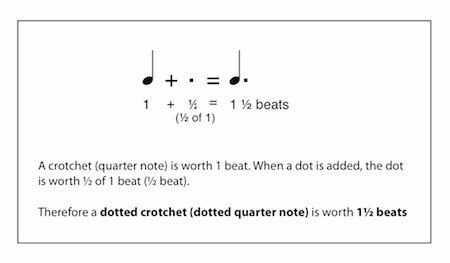 How many beats does a dotted crotchet have? What does a dot after a note mean? How do I count a dotted quaver? Test yourself by calculating the values of the dotted whole note (dotted semibreve) and dotted eighth note (dotted quaver) shown below. When you think you have worked out how many beats each note is worth click the note to find out if you are correct! 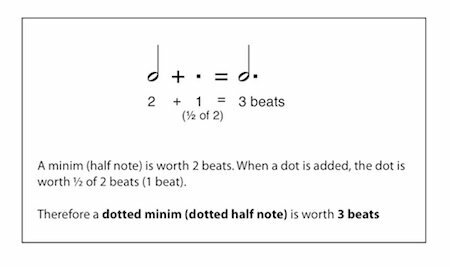 Calculate the value of the dotted eighth note and click to find if you are correct. But how do I play it? However, understanding how dotted notes work doesn't necessarily help you when you have to play them! When I was young I understood that a dotted quarter note (or dotted crotchet as I learned) was worth 1½ beats and usually followed by an eighth note (quaver) but that didn't actually help me when I was sitting at the piano trying to 'count' 1½ beats for the dotted quarter note and ½ beat for the eighth note! In the end I figured out that the easiest way to approach this was to just count the beats in the bar (1 2 3 4) and aim to fit the eighth note in the middle of the beats without trying to count 1½. I counted and on the eighth note to help me, but I didn't used to count and on the other beats as I found it too confusing. However, I have shown it both ways here as I know some of my students find this method of counting easier. As I mentioned earlier, some people prefer to count all the beats (1 & 2 & 3 & 4 &) throughout the whole piece. I always found this method harder, but you should try both and see which you prefer.